Powers/Abilities: Superstrong and "able to fly faster than a jet" (fast enough to cover a hundred miles in a couple of minutes). He can fly unaided and unprotected through interstellar space, covering distance such as the Earth to the Moon in minutes. His invulnerability not only has bullets bounce off but also energy rays from aliens pistols; he can also withstand the cold and pressures from being in outer space. He can emit "atomic heat rays" from his body, capable of melting metal. He sometimes uses hypnosis on foes, and occasionally utilized an atomic ray gun of his own invention. History: "Ace Hart, a young scientist, has been able harness atomic energy to his own body, which gives him the strength of twenty men, and enables him to fly faster than a jet." 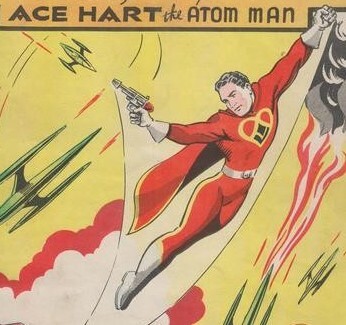 Having developed an elixir that allows him to safely absorb and utilize atomic energy, Ace Hart operated from a laboratory which has a device for sensing when and where people are in danger, so that he could race to their rescue. 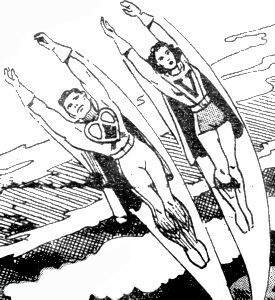 For a little time he partnered himself with Jessie King, who gained the power of flight from Ace's elixir. Later he went to work for the Department of Space Defence under the command of the Director General, and picked up a new partner, Val Venture. Comments: Ace reappeared as a Lliogor host body in Zenith Phase 3. 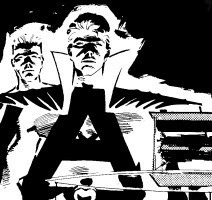 Thanks to Dennis Ray for additional information, most notably expanding greatly on Ace's powers, as well as the bottom left image. Ace Rimmer, What a guy!